How do you overcome limiting beliefs? Why do entrepreneurs struggle with becoming successful? We’ve all faced them at one time or another. Whether that’s the moment of doubt you had before you decided to start a business, or when you started thinking about quitting your 9 – 5. Do you remember those doubting thoughts that crept into your mind and kept you from taking action? From having your initial dream to setting goals, and making plans to reach them, you’ve faced them at every step. 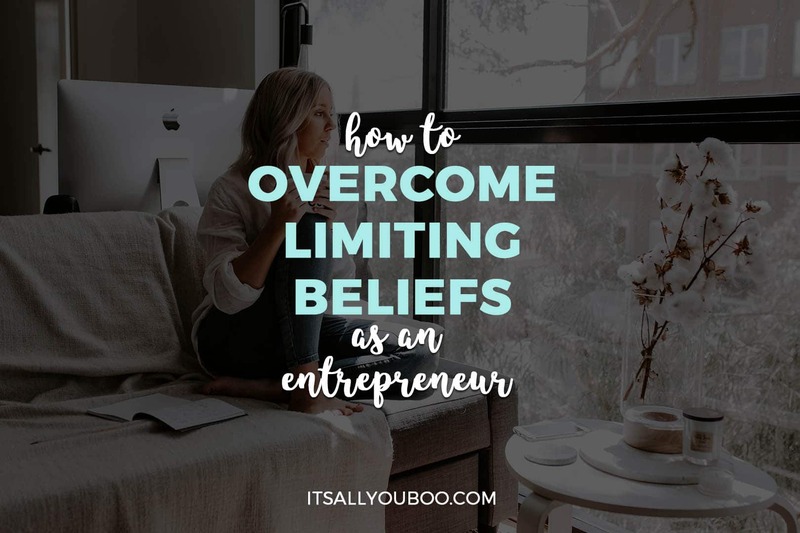 If you’re an entrepreneur who hangs out on the internet, you’ve probably heard of the term: limiting beliefs – and with good reason! They can literally make or break your success as a business (I’ll expand on how & why later). So it’s time to address these and explain what they are, why they’re important, and how to overcome them. The bottom line is, if you want to become successful you need to overcome limiting beliefs. 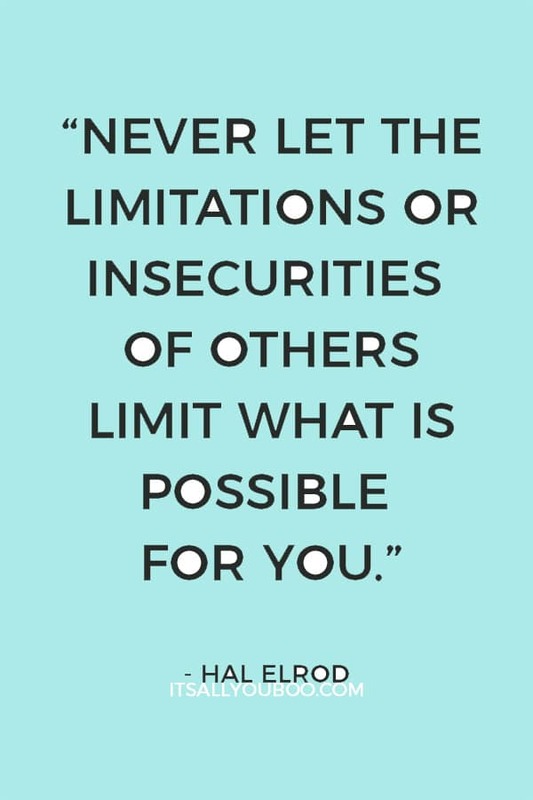 A limiting belief is a belief you have about anything or any subject that limits you in one way or another. That’s it. But it’s not that simple. These beliefs might hold you back from taking proper & good risks, blind you from opportunities, or just keep you stuck focusing on the negative. The challenge with limiting beliefs is that a lot of us don’t think we have them, and they can actually be crazy hard to spot! When I first heard about them, I wasn’t really sure what to think of them. I mean: Do they really hold that much power? Oh, boy – Trust me. They do. And I’m about to lay it all out on how and why. A lot of owning and running a business is ignoring and releasing the negative talk in your head. Yes, critiques and criticisms are a natural part of life, and certainly a natural part of owning a business. But it’s so important not to internalize other people’s opinions of who you are and what you’re doing. ESPECIALLY as an entrepreneur. We just aren’t followers by nature. When your words and your conscious thoughts are not in alignment with the values and beliefs in your subconscious mind, incongruency occurs and a struggle develops. They are also important for your overall mental health. Low self-esteem is strongly correlated to heavy limiting beliefs popping up frequently, and so is depression. On the flipside, taking care of your mental health can have great and positive effects on your mindset as an entrepreneur. So start taking care of your mental health better today! The best way to identify your limiting beliefs is asking questions! So pick a goal that you haven’t achieved yet or an area of life that you would like to improve. Get clear on the outcome you want and then ask yourself the following questions. Write down the first things that come to mind. Being honest with yourself is really the key here! What are your dreams and hope for your future? Why do you think you haven’t achieved this goal already? What do you think your biggest obstacles to achieving this goal are? When you think of this goal what thoughts (both positive and negative) come up? Also, when you think of this goal what emotions (both positive and negative) do you feel? When you think of this goal, do you feel any resistance to creating it? If so, what comes to mind? How deserving of this goal do you feel? Why do you think you feel this way? How much do you truly desire this goal? Why? What are your biggest fears about reaching this goal? How committed are you to this goal? Why? When you finish, I want you to go back through and examine your answers. You’ll be surprised at what limiting beliefs come up during this exercise! There are common limiting beliefs that entrepreneurs have to overcome to be successful. You will never achieve your goals without first comforting your limiting thoughts. Are you starting to see how having these beliefs is keeping you from achieving success? Ready to deal with these limiting beliefs that are sabotaging your success? Here are 5 strategies for overcoming limiting beliefs in your life. When faced with a setback, is your first response defeat feeling? Do you feel like you’ll never reach your goal? Do you see your setback as a failure? Setbacks can actually set the stage for breakthroughs if you perceive them in a positive light. (And breakthroughs are fun!) But far too often, we see them as negative! When you view setbacks or very bad/slow periods in a negative light, even though everyone goes through these times occasionally no matter how successful they are, you become focused on what’s not working well. You start to experience what is commonly called a “breakdown”. And those are never fun! Trust me, I’ve been through one. So start seeing setbacks as positive because they are actually GOOD for you and your business! Start seeing setbacks as opportunities for your business and you. Everything you need in order to succeed is available to you right now. 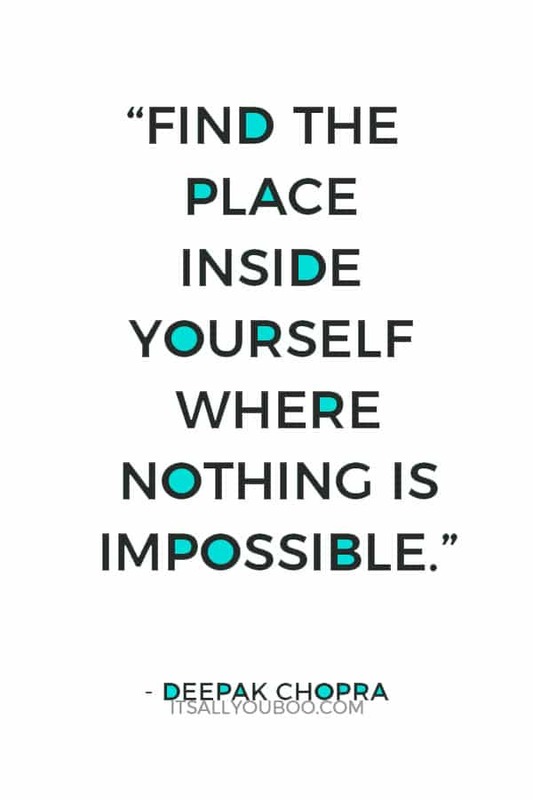 All you need to do is to believe it’s possible and then take action. That’s it! Start saying yes to the opportunities that are available to you right now. For instance, what could you be doing to improve your business right now? Would you benefit by working with a business coach? Could you enhance your customer/client experience or service delivery model? Explore different ways to fulfill a client need? Look for the next step that can take you to your goal, then follow through and just take action. Acting like a success helps you grow into being a success. It’s having a fake it until you make it mentality. They have a different mindset. They don’t really see a failure like others do, instead, they twist it into something to be happy about because they know this was a lesson, learning opportunity or one step closer to a breakthrough moment. You don’t need to have all of the skills you think you need to have in the industry you’re in as an entrepreneur – You can *learn* how to be a successful entrepreneur, and acting as you have already achieved success is a great way to start. A lot of people say, “When this happens, then I will make some changes or I’ll start doing XYZ” They put off into the future what they could be doing now. Look at your goals and really begin to believe they are possible. Don’t focus on the negative or wonder whether or not you’ll ever get there. Start looking for opportunities to meet your goals instead. Your goals may be a stretch for you, but if you’re fully committed, you’ll eventually get there! Want to achieve your goals? Good, visualize it in your mind, see it, believe wholeheartedly that it’s future. All of these changes, when combined with actions that continue to advance your business, will build on themselves. They will come together and create exponential, positive results. Yup! We’re going to be using what is called “empowering beliefs” now. I want you to make a new belief, that replaces the other belief in a way that’s kind of like a positive affirmation. (Which I’m sure you’ve heard of) Make sure that this new belief is believable. If it’s not believable, then you will fail to condition it deep into your subconscious. To unlock this new empowering belief, consider the goal that you’d like to achieve, the core values you’d like to uphold, the person that you’d want to become. Also, I’d like you to make sure these have proofs of why they are believable. The more reasons you can find, the more motivation you will have to change your old patterns of behavior and replace them with new empowering belief systems. Here are some exercises you can go through to totally overcome your limiting beliefs as an entrepreneur. Have you always had this belief? What evidence do you have that it is true? What evidence do you have that this belief is not necessarily true? What would it feel like if I were open to the possibility that this limiting belief isn’t true? What would it feel like? And make this question very specific to whatever your painful thought is. What do you feel in your body? How is this being internalized? This takes empowering beliefs & positive affirmations straight to the core of your being because you are actually physically feeling in your body what it is like to open to new possibilities. This allows you to heal those limiting beliefs not just mentally, but emotionally and physically as well. Ready to create a powerful mantra (aka an affirmation) to overcome your limiting beliefs? 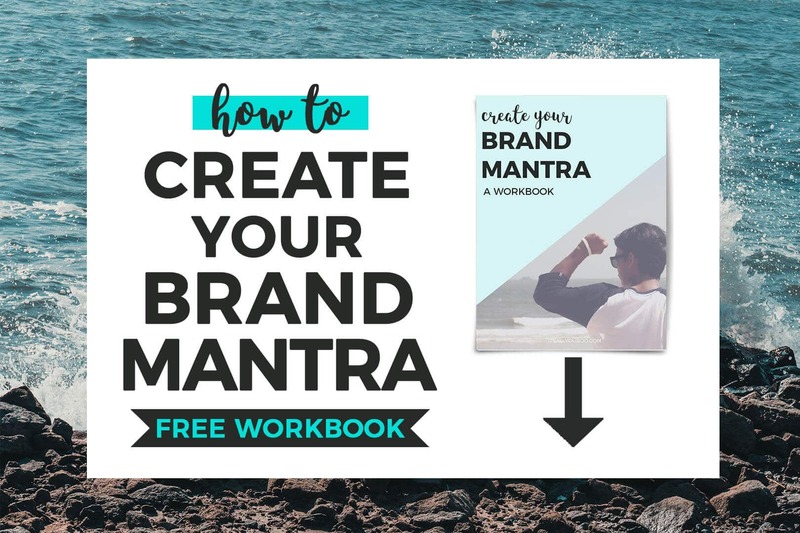 Get your FREE printable or form-fillable Brand Mantra Workbook. 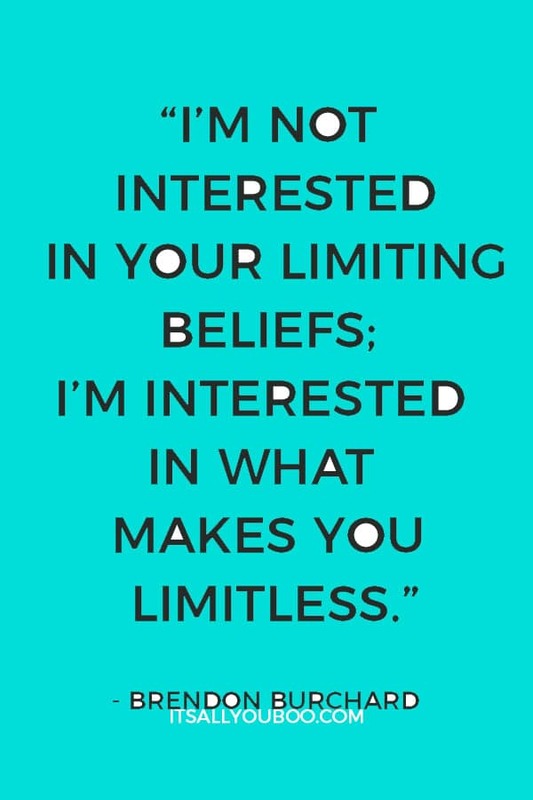 Limiting beliefs are definitely not any fun. But if you approach them properly, you’ll be able to slay your goals and objectives, and not to mention be able to feel like the fabulous entrepreneur you already are and are meant to be! 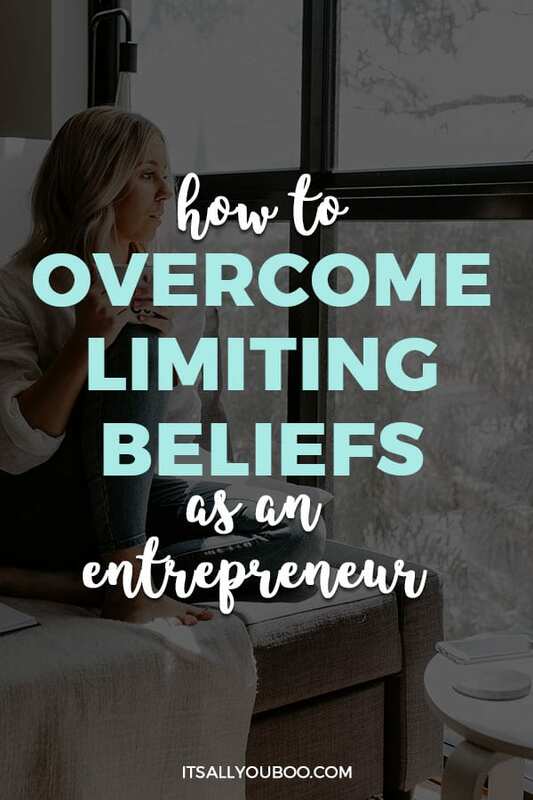 Ready to overcome limiting beliefs as an entrepreneur? 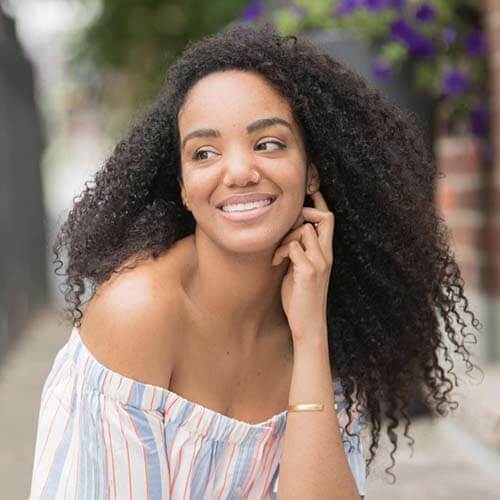 Brooke S. Jackson is a passionate OBM (Online Business Manager) – she genuinely helps online-business owners who know their current operations and business systems need support. They need to properly manage projects and launches, but it just doesn’t come naturally to them, they don’t want to do it, they just don’t have time. So motivating! It’s so easy to feel down and out on the journey of entrepreneurship but staying goal oriented is helpful! I think “Acting Like You’re Already a Success” is a really good tip. You’re putting it into the universe; you’re owning it and not just claiming it. This is really good. If we are not careful to check our limiting beliefs it can really hinder our business and lives. This has been a very, very helpful read. I have been struggling a bit with gaining traction for my boutique. I won’t give up though. Thanks for this. You’re very welcome, Antoinette! Mindset is SO crucial these days. I agree. I try my best to run my blog like hundreds of thousands of people are reading it. I want to prepare for its success instead of just hoping for it. Haha yes! Writing goals out can be so important. Do you use SMART goals? There are a lot of doubts that come up when you’re an entrepreneur. What works for my is to not over-analyze the situation. Either I’m going to do it or not. If I think too hard on the matter, chances are I’m going to talk myself out of it. So true. Even I can attest to this. What kind of doubts have been the hardest to get over for you? A lot of people suffer from comparisonitis too. They look at what others have accomplished and feel pressure to do the same or more. 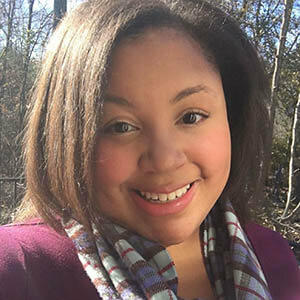 Sometimes being an entrepreneur can be so hard to keep yourself motivated because of minor roadblocks. But just like your blog name Its All You Boo! Great read and so much truth. Just pushes people to keep pushing forward. This is right on time for me and the direction I need to move in. Mindset IS everything. There’s a huge goal I accomplished last year because I wrote it down and set an intention. I need to do that more often. Doubt is a killer of joy for sure. I know that what is for me shall not pass me. The sky is the limit and I am reaching for it all. Even when I’m not sure if it will work. This is such a robust post for surviving entrepreneurship. So many great tips to use! Being an entrepreneur forces you to face and slay your dragons, or negative beliefs every single day. Thank you for this jolt of inspiration. I’ll be referring back to your affirming principles the next time I feel defeated.